For grammatical articles in English, see English articles. "Definite article" redirects here. For the Eddie Izzard comedy DVD, see Definite Article. In many languages, articles are a special part of speech which cannot be easily combined[clarification needed] with other parts of speech. In English grammar, articles are frequently considered part of a broader category called determiners, which contains articles, demonstratives (such as "this" and "that"), possessive determiners (such as "my" and "his"), and quantifiers (such as "all" and "few"). Articles and other determiners are also sometimes counted as a type of adjective, since they describe the words that they precede. In languages that employ articles, every common noun, with some exceptions, is expressed with a certain definiteness, definite or indefinite, as an attribute (similar to the way many languages express every noun with a certain grammatical number—singular or plural—or a grammatical gender). Articles are among the most common words in many languages; in English, for example, the most frequent word is the. Articles are usually categorized as either definite or indefinite. A few languages with well-developed systems of articles may distinguish additional subtypes. Within each type, languages may have various forms of each article, due to conforming to grammatical attributes such as gender, number, or case. Articles may also be modified as influenced by adjacent sounds or words as in elision (e.g., French "le" becoming "l'" before a vowel), epenthesis (e.g., English "a" becoming "an" before a vowel), or contraction (e.g. Irish "i + na" becoming "sna"). which uses an indefinite article, which does not specify what book is to be given. Before some words beginning with a pronounced (not silent) h in an unstressed first syllable, such as historic(al), hallucination, hilarious, horrendous, and horrific, some (especially older) British writers prefer to use an over a (an historical event, etc.). An is also preferred before hotel by some writers of British English (probably reflecting the relatively recent adoption of the word from French, in which the h is not pronounced). The use of "an" before words beginning with an unstressed "h" is more common generally in British English than in American. American writers normally use a in all these cases, although there are occasional uses of an historic(al) in American English. According to the New Oxford Dictionary of English, such use is increasingly rare in British English too. Unlike British English, American English typically uses an before herb, since the h in this word is silent for most Americans. The correct usage in respect of the term "hereditary peer" was the subject of an amendment debated in the UK Parliament. The word some can be viewed as functionally a plural of a/an in that, for example, "an apple" never means more than one apple but "give me some apples" indicates more than one is desired but without specifying a quantity. In this view it is functionally homologous to the Spanish plural indefinite article unos/unas; un/una ("one") is completely indistinguishable from the unit number, except where it has a plural form (unos/unas). Thus Dame una manzana" ("Give me an apple") but "Dame unas manzanas" ("Give me some apples"). The indefiniteness of some or unos can sometimes be semiquantitatively narrowed, as in "There are some apples there, but not many." Some also serves as a singular indefinite article, as in "There is some person on the porch". A proper article indicates that its noun is proper, and refers to a unique entity. It may be the name of a person, the name of a place, the name of a planet, etc. The Maori language has the proper article a, which is used for personal nouns; so, "a Pita" means "Peter". In Maori, when the personal nouns have the definite or indefinite article as an important part of it, both articles are present; for example, the phrase "a Te Rauparaha", which contains both the proper article a and the definite article Te refers to the person name Te Rauparaha. The definite article is sometimes also used with proper names, which are already specified by definition (there is just one of them). For example: the Amazon, the Hebrides. In these cases, the definite article may be considered superfluous. Its presence can be accounted for by the assumption that they are shorthand for a longer phrase in which the name is a specifier, i.e. the Amazon River, the Hebridean Islands. Where the nouns in such longer phrases cannot be omitted, the definite article is universally kept: the United States, the People's Republic of China. This distinction can sometimes become a political matter: the former usage the Ukraine stressed the word's Russian meaning of "borderlands"; as Ukraine became a fully independent state following the collapse of the Soviet Union, it requested that formal mentions of its name omit the article. Similar shifts in usage have occurred in the names of Sudan and both Congo (Brazzaville) and Congo (Kinshasa); a move in the other direction occurred with The Gambia. In certain languages, such as French and Italian, definite articles are used with all or most names of countries: la France/le Canada/l'Allemagne, l'Italia/la Spagna/il Brasile. If a name [has] a definite article, e.g. the Kremlin, it cannot idiomatically be used without it: we cannot say Boris Yeltsin is in Kremlin. Some languages also use definite articles with personal names. For example, such use is standard in Portuguese (a Maria, literally: "the Maria"), in Greek (η Μαρία, ο Γιώργος, ο Δούναβης, η Παρασκευή) and in Catalan (la Núria, el/en Oriol). It also occurs colloquially or dialectally in Spanish, German, French, Italian and other languages. In Hungary it is considered to be a Germanism. Rarely, this usage can appear in English. A prominent example is how President of The United States and businessman Donald Trump is known as "The Donald", this wording being used by many publications such as Newsweek and New York Post. Another is US President Ronald Reagan's nickname of "The Gipper"; publisher Townhall.com issued an article after Reagan's death titled simply "Goodbye to 'the Gipper'". A partitive article is a type of article, sometimes viewed as a type of indefinite article, used with a mass noun such as water, to indicate a non-specific quantity of it. Partitive articles are a class of determiner; they are used in French and Italian in addition to definite and indefinite articles. (In Finnish and Estonian, the partitive is indicated by inflection.) The nearest equivalent in English is some, although the latter is classified as a determiner but not in all authorities' classifications as an indefinite article, and English uses it less than French uses de. French: Veux-tu du café ? Do you want (some) coffee? Haida has a partitive article (suffixed -gyaa) referring to "part of something or... to one or more objects of a given group or category," e.g., tluugyaa uu hal tlaahlaang "he is making a boat (a member of the category of boats)." No man has been on this island. No dogs are allowed here. The zero article is the absence of an article. In languages having a definite article, the lack of an article specifically indicates that the noun is indefinite. Linguists interested in X-bar theory causally link zero articles to nouns lacking a determiner. In English, the zero article rather than the indefinite is used with plurals and mass nouns, although the word "some" can be used as an indefinite plural article. Note that although the Saami languages spoken in northern parts of Norway and Sweden lack articles, Norwegian and Swedish are the majority languages in this area. Note also that although the Irish, Scottish Gaelic and Welsh languages lack indefinite articles they too are minority languages in Ireland, Scotland and southern Wales, respectively, with English being the main spoken language. Articles are found in many Indo-European languages, Semitic languages (only the definite article), and Polynesian languages, but are formally absent from many of the world's major languages, such as Chinese, Indonesian, Japanese, Hindi, Punjabi, Urdu, the majority of Slavic and Baltic languages (incl. Russian), Yoruba, and the Bantu languages. In some languages that do have articles, like for example some North Caucasian languages, the use of articles is optional but in others like English and German it is mandatory in all cases. Linguists believe the common ancestor of the Indo-European languages, Proto-Indo-European, did not have articles. 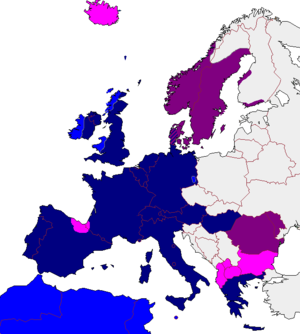 Most of the languages in this family do not have definite or indefinite articles: there is no article in Latin or Sanskrit, nor in some modern Indo-European languages, such as the families of Slavic languages (except for Bulgarian and Macedonian, which are rather distinctive among the Slavic languages in their grammar) and Baltic languages. Although Classical Greek had a definite article (which has survived into Modern Greek and which bears strong functional resemblance to the German definite article, which it is related to), the earlier Homeric Greek used this article largely as a pronoun or demonstrative, whereas the earliest known form of Greek known as Mycenaean Greek did not have any articles. Articles developed independently in several language families. Not all languages have both definite and indefinite articles, and some languages have different types of definite and indefinite articles to distinguish finer shades of meaning: for example, French and Italian have a partitive article used for indefinite mass nouns, whereas Colognian has two distinct sets of definite articles indicating focus and uniqueness, and Macedonian uses definite articles in a demonstrative sense, with a tripartite distinction (proximal, medial, distal) based on distance from the speaker or interlocutor. The words this and that (and their plurals, these and those) can be understood in English as, ultimately, forms of the definite article the (whose declension in Old English included thaes, an ancestral form of this/that and these/those). In many languages, the form of the article may vary according to the gender, number, or case of its noun. In some languages the article may be the only indication of the case. Many languages do not use articles at all, and may use other ways of indicating old versus new information, such as topic–comment constructions. Assamese -tû, -ta, -ti, -khôn, -khini, -zôn, -zôni, -dal, -zûpa etc. êta, êkhôn, êzôn, êzôni, êdal, êzûpa etc. * Grammatically speaking Finnish has no articles, but the words se (it) and yks(i) (one) are used in the same fashion as the and a/an in English and are, for all intents and purposes, treated like articles when used in this manner in colloquial Finnish. Note: Aramaic is written from right to left, so an Aleph is added to the end of the word. ם becomes מ when it is not the final letter. Assamese: "কিতাপ (kitap)", book; "কিতাপখন (kitapkhôn)" : "The book"
Bengali: "Bôi", book; "Bôiti/Bôita/Bôikhana" : "The Book"
A different way, limited to the definite article, is used by Latvian and Lithuanian. The noun does not change but the adjective can be defined or undefined. In Latvian: galds, a table / the table; balts galds, a white table; baltais galds, the white table. In Lithuanian: stalas, a table / the table; baltas stalas, a white table; baltasis stalas, the white table. Languages in the above table written in italics are constructed languages and are not natural, that is to say that they have been purposefully invented by an individual (or group of individuals) with some purpose in mind. They do, however, all belong to language families themselves. Esperanto is derived from European languages and therefore all of its roots are found in Proto-Indo-European and cognates can be found in real-world languages like French, German, Italian and English. Interlingua is also based on European languages but with its main source being that of Italic descendent languages: English, French, Spanish, Italian and Portuguese, with German and Russian being secondary sources, with words from further afield (but internationally known and often borrowed) contributing to the language's vocabulary (such as words taken from Japanese, Arabic and Finnish). The result is a supposedly easy-to-learn language for the world. As well as these "auxiliary" languages the list contains two more: Quenya and Sindarin; these two languages were created by Professor Tolkien and used in his fictional works. They are not based on any real-world language family (as are Esperanto and Interlingua), but do share a common history with roots in Common Eldarin. Articles have developed independently in many different language families across the globe. Generally, articles develop over time usually by specialization of certain adjectives or determiners, and their development is often a sign of languages becoming more analytic instead of synthetic, perhaps combined with the loss of inflection as in English, Romance languages, Bulgarian, Macedonian and Torlakian. Joseph Greenberg in Universals of Human Language describes "the cycle of the definite article": Definite articles (Stage I) evolve from demonstratives, and in turn can become generic articles (Stage II) that may be used in both definite and indefinite contexts, and later merely noun markers (Stage III) that are part of nouns other than proper names and more recent borrowings. Eventually articles may evolve anew from demonstratives. Definite articles typically arise from demonstratives meaning that. For example, the definite articles in most Romance languages—e.g., el, il, le, la, lo — derive from the Latin demonstratives ille (masculine), illa (feminine) and illud (neuter). The English definite article the, written þe in Middle English, derives from an Old English demonstrative, which, according to gender, was written se (masculine), seo (feminine) (þe and þeo in the Northumbrian dialect), or þæt (neuter). The neuter form þæt also gave rise to the modern demonstrative that. The ye occasionally seen in pseudo-archaic usage such as "Ye Olde Englishe Tea Shoppe" is actually a form of þe, where the letter thorn (þ) came to be written as a y. Multiple demonstratives can give rise to multiple definite articles. Macedonian, for example, in which the articles are suffixed, has столот (stolot), the chair; столов (stolov), this chair; and столон (stolon), that chair. These derive from the Common Slavic demonstratives *tъ "this, that", *ovъ "this here" and *onъ "that over there, yonder" respectively. Colognian prepositions articles such as in dat Auto, or et Auto, the car; the first being specifically selected, focused, newly introduced, while the latter is not selected, unfocused, already known, general, or generic. Standard Basque distinguishes between proximal and distal definite articles in the plural (dialectally, a proximal singular and an additional medial grade may also be present). The Basque distal form (with infix -a-, etymologically a suffixed and phonetically reduced form of the distal demonstrative har-/hai-) functions as the default definite article, whereas the proximal form (with infix -o-, derived from the proximal demonstrative hau-/hon-) is marked and indicates some kind of (spatial or otherwise) close relationship between the speaker and the referent (e.g., it may imply that the speaker is included in the referent): etxeak ("the houses") vs. etxeok ("these houses [of ours]"), euskaldunak ("the Basque speakers") vs. euskaldunok ("we, the Basque speakers"). Speakers of Assyrian Neo-Aramaic, a modern Aramaic language that lacks a definite article, may at times use demonstratives aha and aya (feminine) or awa (masculine) – which translate to "this" and "that", respectively – to give the sense of "the". Indefinite articles typically arise from adjectives meaning one. For example, the indefinite articles in the Romance languages—e.g., un, una, une—derive from the Latin adjective unus. Partitive articles, however, derive from Vulgar Latin de illo, meaning (some) of the. The English indefinite article an is derived from the same root as one. The -n came to be dropped before consonants, giving rise to the shortened form a. The existence of both forms has led to many cases of juncture loss, for example transforming the original a napron into the modern an apron. The Persian indefinite article is yek, meaning one. ^ "What Is a Determiner?". YourDictionary. ^ "Using Articles—A, An, The | Scribendi.com". Scribendi. ^ "The 500 Most Commonly Used Words in the English Language". World English. Archived from the original on 13 January 2007. Retrieved 2007-01-14. ^ "Definite article". Cambridge Dictionary. Retrieved 10 July 2018. ^ a b New Oxford Dictionary of English, 1999, usage note for an: "There is still some divergence of opinion over the form of the indefinite article to use preceding certain words beginning with h- when the first syllable is unstressed: ‘a historical document’ or ‘an historical document’; ‘a hotel’ or ‘an hotel’. The form depends on whether the initial h is sounded or not: an was common in the 18th and 19th centuries, because the initial h was commonly not pronounced for these words. In standard modern English the norm is for the h to be pronounced in words like hotel and historical, and therefore the indefinite article a is used; however, the older form, with the silent h and the indefinite article an, is still encountered, especially among older speakers." ^ Burchfield, R. W. (1996). The New Fowler's Modern English Usage (3rd ed.). p. 512. ISBN 978-0199690367. ^ Argetsinger, Amy (1 September 2015). "Why does everyone call Donald Trump 'The Donald'? It's an interesting story". Washington Post. Retrieved 3 October 2017. ^ Lawrence, Erma (1977). Haida dictionary. Fairbanks: Alaska Native Language Center. p. 64. ^ Master, Peter (1997). "The English article system: Acquisition, function, and pedagogy". System. 25 (2): 215–232. doi:10.1016/S0346-251X(97)00010-9. ^ a b c d e f g h i j k l m n o p q Simona, Ropati (1986). Tokelau Dictionary. New Zealand: Office of Tokelau Affairs. p. Introduction. ^ "Genetic Linguistics:Essays on Theory and Method". google.com. Wikisource has the text of the 1921 Collier's Encyclopedia article Article. "The Definite Article, 'The': The Most Frequently Used Word in World's Englishes"